Video training is a fast and effective way to bring your team up to speed. According to Salesforce, more than 50% of sales managers report themselves as being too busy to train and develop their sales teams. This is not shocking; the majority of sales leaders rank their #1 priority as new revenue growth (CSO Insights). Of course, while training and development is a necessity for long-term success, an urgent deal takes priority in the short team. For this reason, it is important for sales leaders to be able to train their employees as they go, without setting aside large chunks of time. As sales leaders are looking for fast, efficient ways to impart knowledge, video stands out as a powerful medium. With video, you can capture information as it happens in real time - best practices from your sales team, screen recordings of processes as you follow them, etc. - without having to create all of this yourself. Emily Hauptvogel, Director of Sales and Marketing at H&H Products Company, recommends using video to train new and existing employees. Video is also more engaging for your employee to learn from. You can demonstrate tough content, systems and processes, best practices AND show the fun, creativity, and culture of your team. With video, you can both instruct and inspire. Meeting tons of new people at once can be overwhelming. To ease the social anxiety, make a video collaboration of every person on your team who the new employee will be working with introducing his or herself. Send this to them before they start, so they will be able to match the face to the name on day 1, and have a sense of everyone’s personality. Instead of a list of traits, attributes, and characteristics, introduce your new employee to the customers through a video testimonial. Let them hear, in the customers own voice, what their needs are, and how your product solves their needs. Even if your new hire has experience with some of the tools you use (Salesforce, Slack, SalesLoft, Google Drive, Outlook, etc. ), they are probably not used to doing things exactly the same way. Simple videos like “How to add an opportunity in Salesforce,” or “How to set up a new cadence in SalesLoft”can go far in training new employees, and guaranteeing that you don’t have to repeat yourself. GridTip: For maximal efficiency, record yourself speaking aloud as you go through the process yourself, instead of creating a training video from scratch. As a salesperson, your employee has to be the product expert for buyers. Make product walkthroughs the employees can watch to learn the product in depth. GridTip: Test comprehension with a quiz question at the end of the videos. Let new employees practice their sales pitches on videos a few times to nail down messaging and delivery until they are ready to speak to buyers. As a Sales Manager, you can watch videos and leave feedback and suggestions throughout the video to help your employee improve. Sales Performance International found that ~50% of training is forgotten within 5 weeks. Save yourself the repetition and make sure that this training is available at any time in the future. With a Video Training Library, you can organize all of your training videos into one library employees can search to answer questions and review material at any time. Remember, not everything in this folder has to be created from scratch. 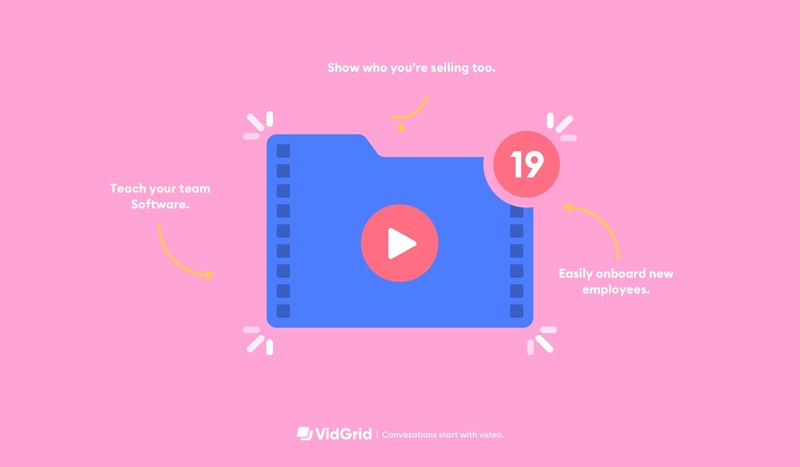 Consolidate some of the best videos from your star employees so others can learn from them. Sharing successes reinforces good behavior in your salespeople and encourages them to work harder and smarter. Have employees subscribe, so they can stay up to date as new features and best practices emerge. The same video best practices apply to employee training. Make videos bite sized, quick, and engaging. Just like with selling to potential customers, you want to personalize content to the needs of your employees. Salespeople tend to be particularly goal driven… So why not reward training goals? Track what videos your employees complete and gamify the process. Have rewards when they complete sections or all of their training.